Florida Gators basketball (4-4) got back to .500 on the season in dominating fashion, obliterating the Yale Bulldogs (8-3) on Monday evening at the Stephen C. O’Connell Center in Gainesville, Florida. Florida beat Yale 85-47 and held a 49-point lead during the contest, winning both halves with ease while potentially turning a corner after a rough start to the season. It was over when/significant stretch: The second half began. Already leading by 26 coming out of the break, Florida extended its advantage to 35 with an 11-2 run to open the latter period. A pair of threes from redshirt junior forward Dorian Finney-Smith, plus another from junior guard Michael Frazier II, gave UF its large advantage, which it would be expanded to 49 with 7:14 to play. First half focus: Combining a pair of long runs, Florida broke out of the doldrums with a 24-8 scoring stretch over the final 7:21 of the first 20 minutes to lead 46-20 at the break. Frazier was 6-for-8 from the field and 3-for-5 from downtown for 15 points in the opening period, while redshirt senior forward Jacob Kurtz was 4-for-4 for eight points of his own. UF started 2-of-8 from the floor but made 19 of its final 24 shots. 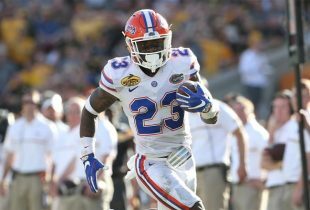 Prominent players: The Gators earned themselves a team award on Monday. Frazier led the way with 18 points on 7-of-11 shooting (4-of-7 from beyond the arc) but was just one of four Florida players to score in double figures. Kurtz checked in with a career-high 10 on perfect 5-of-5 shooting, Finney-Smith finished with 14 while hitting 6-of-8 shots (2-of-3 from deep), and sophomore F Chris Walker notched a career-high 13 while going 6-for-10. The rest of the team was impressive in its own right, combining to go 13-for-24 from the field as UF shot 64 percent overall on the evening. Perfect plays: Early in the first half, freshman point guard Chris Chiozza drove the open lane but caught sophomore F Chris Walker out of the corner of his eye, flinging the ball upwards for Walker to slam home as part of an 18-5 extended scoring stretch that put Florida up 22-10 with nine minutes left in the first half. Midway through the second half, Chiozza hit a step-back three to beat the shot clock, and Walker checked in again with a powerful finish on alley-oop from sophomore PG Kasey Hill. A fastbreak dunk from Kurtz was another highlight that drew a huge reaction from the Gators’ bench (see bottom of post). Perhaps the sequence of the game, however, was Walker completely laying out for a loose ball that he was not able to cradle, only to be rewarded on the back end with a powerful fastbreak dunk that crushed the Bulldogs’ hearts. The contest did not end with another rim-rocker, though, as Robinson cleaned up a missed three from freshman walk-on G Zach Hodskins with a two-handed jam during the final minute. Standout stats: Florida absolutely dominated the paint on Monday, outscoring Yale 52-16 down low. The Gators also struggled to rebound early in the contest but did not have much trouble as the game wore on, outgaining the Bulldogs 33-23 on the glass, leading to a 18-7 advantage in second-chance points. What it means: Though this was a game Florida was supposed to win, the Gators may have gained some much-needed and long-overdue confidence from one of the most dominant performances in school history. Next up: Florida will look to double-down on its success this week when it hosts Texas Southern on Friday at 7 p.m. Applause! Applause! Applause! I thought they were going to hit 100 there for a minute. That is what I expected out of this team. Fast and furious high scoring. Way to go Gators! A dunk-fest!…Walker’s 2nd dunk was spectacular!…even Hill & Kurtz got into the act. Either UConn is really bad or Yale just had an off night. I doubt it’ll be thought of as a “quality non conference win” down the road. Billy’s boys are getting better though. Go Gators!